From now on the fixed internet U!Net Lite tariff plan subscribers will enjoy the speed of 6 Mb/sec instead of the previous 3 Mb/sec. In case they join the offer for 12 months, they will benefit from the speed of 12 Mb/sec instead of the previous 6 Mb/sec. Meanwhile the monthly fee of U!Net Lite tariff plan shall remain unchanged – 6 000 AMD only – and in case the subscriber joins the offer for 12 months, he/she will take advantage of the free WiFi activation. 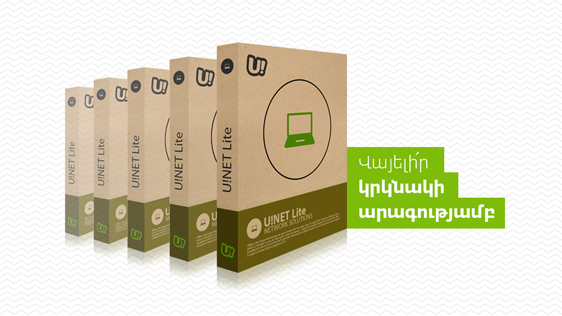 The change is applicable to the existing customers as well, who have joined the U!Net Lite tariff plan from June 1, 2016 till October 4, 2016. Rural residents can also join U!Net Lite, sign a contract for 12 months and for only 6 000 AMD per month get 20 Mb/sec speed, as well as free WiFi activation.